Sylvain Loosli in Seat 1. Michiel Brummelhuis in Seat 2. Mark Newhouse in Seat 3. Ryan Riess in Seat 4. Israeli native Amir Lehavot is the elder statesman of the November Nine at 38 years old and two months. Lehavot, who now resides in Weston, Florida, holds an engineering degree from the University of Texas at Austin, though it’s not being put to direct use as he has been a professional poker player for a number of years. Since 2009 and prior to this result in the Main Event, Lehavot had amassed 12 World Series of Poker cashes totaling $818,414. That includes a win at the 2011 WSOP in Event #7 $10,000 Pot-Limit Hold’em Championship for $573,456 and his first WSOP gold bracelet. He defeated a stacked final table in that tournament which included McLean Karr (8th), Stephen Chidwick (4th), Sam Stein (3rd) and Jarred Solomon (2nd). That was Lehavot’s biggest career score, but of course the $733,224 he’s guaranteed for making the November Nine will surpass that. Other highlight’s from Lehavot’s poker career include a fourth-place finish in the 2011 World Poker Tour L.A. Poker Classic $10,000 Championship Event for $421,680; first in a $1,900 No Limit Hold’em event at the Bay 101 Shooting Star for $140,500; 15th in the 2011 WSOP Europe Main Event for $57,442; and 226th in the 2009 WSOP Main Event for $32,963. Lehavot has also put in his dues online where he won more than $500,000 playing multi-table tournaments on PokerStars under the moniker "AmirSF." Lehavot steadily built his stack throughout the first six days of the tournament before having a dream level of Day 7. 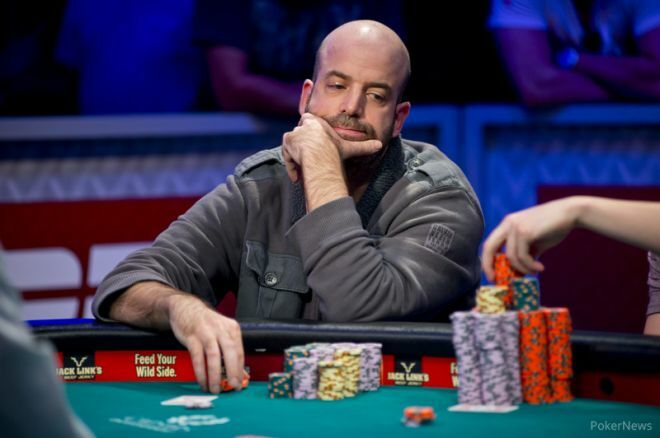 In the span of two hours Lehavot grew his stack from 1.7 million to 17 million. He was able to do so in part by turning quads and doubling through James Alexander before eliminating that same opponent a short time later. Lehavot then eliminated Sergio Castelluccio in 14th place to chip up to over 30 million. He then went on to make the November Nine with 29.7 million, good enough for the second biggest stack. Lehavot's seat at the table isn't ideal, but it's not terrible either. He's got Marc McLaughlin, the third biggest stack, to his direct left and chip leader JC Tran one seat after that. On the flip side, Lehavot has position on Ryan Riess, who has the fifth-biggest stack, and two of the shorter stacks. If one of those shorties were to shove, Lehavot will be in position to possibly wake up with a hand and pick up some chips. Regardless of his position, Lehavot has a bit of an edge over everyone but Tran as he has WSOP final table experience and knows how to close out a win. Leading up to the final table, Lehavot, who conjures up images of Homer Simpson, was no doubt underestimated. He comes across as tight and passive, but that façade won't be there come November. Rest assured the rest of the final table will be aware of Lehavot's accomplishments and will have plenty of material to study from the hand history of his WSOP win to the broadcast of his WPT final table. Make no mistake, Lehavot is one of the most accomplished players at the final table and will be a force to be reckoned with. To review the 2013 WSOP Main Event live coverage, be sure to check out the tournament page in our live reporting blog. As always, get all the latest PokerNews updates on your social media outlets. Follow us on Twitter and find us on both Facebook and Google+!